Until recently, there was rather little interest in the structure-activity relationships (SARs) of cathinone analogs because so few agents were available and because they represented a relatively minor drug abuse problem. Most of the early SAR was formulated on the basis of behavioral (e.g., locomotor and drug discrimination) studies using rodents. 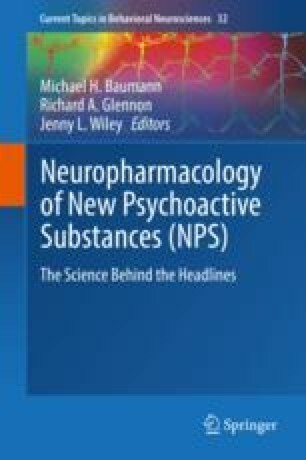 With the emergence on the clandestine market in the last few years of a large number of new cathinone analogs, termed “synthetic cathinones”, and the realization that they likely act at dopamine, norepinephrine, and/or serotonin transporters as releasing agents (i.e., as substrates) or reuptake inhibitors (i.e., as transport blockers), it has now become possible to better examine their SAR and even their quantitative SAR (QSAR), in a more effective and systematic manner. An SAR picture is beginning to emerge, and key structural features, such as the nature of the terminal amine, the size of the α-substituent, stereochemistry, and the presence and position of aromatic substituents, are being found to impact action (i.e., as releasing agents or reuptake inhibitors) and transporter selectivity. Work from the authors’ laboratory was supported by US Public Health Services grants DA-01642 and DA-033930.